SOME constructional details are now available regarding the Perman single-seater parasol monoplane, to which reference has been made in the recent ДальшеMore>>> issues of Flight. The machine has recently been undergoing flying trials, and some very satisfactory results are reported. Built by a firm which has entered the aircraft industry by way of Pou-du-Ciel, the Perman Midget represents an effort to produce a single-seater of reasonably good performance at a price quite considerably below ^200. Its designer, Mr. F. W. Broughton in confident that manufacture in quantities at low cost will present few difficulties. Except that the power unit is a 10 h.p. Ford as adapted by Permans for Pou-du-Ciel work, the newcomer bears no affinity to the Pou, unless it be the fact that the wing is of rather low aspect ratio (5:1) and is of Clark Y section modified by having a slightly reflexed trailing edge. With this layout goes a short fuselage and lateral control in these circumstances calls for rather generous rudder area, but the machine has given no evidence of being over-ruddered. Carried 18 in. 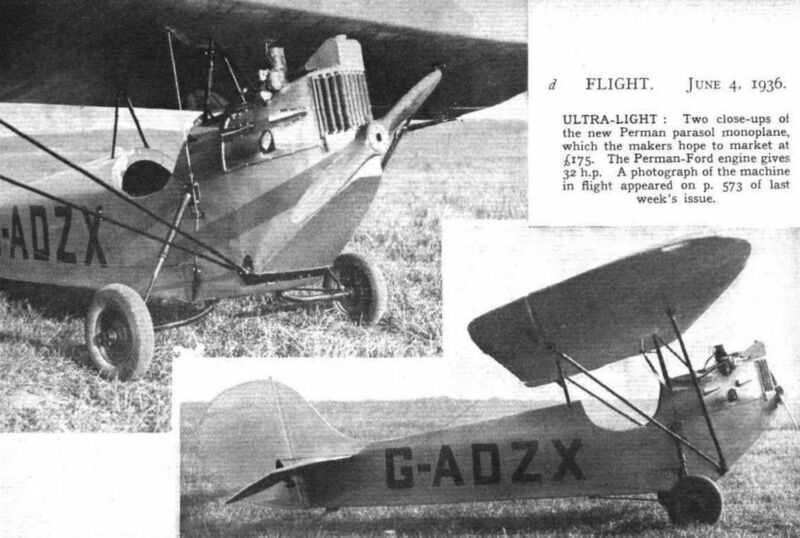 above the fuselage on two triangular tubular pylons, the parasol wing is of 25ft. span, and of 5ft. constant chord. There.is no dihedral other than that given by a tapering of the lower edges of the two box spars towards the tips. There are 24 spruce and plywood ribs of fairly orthodox construction. The wing-tip formers embody hand-grips, there are ailerons of 6 sq. ft. area each, and the centre section contains a six-gallon fuel tank, in a position which obviously makes a gravity feed a very simple matter. There is also room for a smaller reserve tank to be fitted forward of the front spar. The short fuselage is of very simple, straightforward construction, consisting of four spruce longerons spaced by four bulkheads aft of the cockpit and the engine bulkhead forward. The front ends of the longerons terminate in the hardwood mountings which carry the forward engine bearers and the radiator. At its rear end the engine is carried on the standard Ford bearers bolted to hardwood blocks on the top longerons. The fuselage framework is stiffened up by a "double-skin" covering of 3 mm. plywood on the inside and 1.5 mm. on the outside. The fuselage is turtle-decked with bent ply, which is very neatly faired into the fin and tail plane. On each side two metal struts, diverging from a single point at the base of the fuselage, brace the wing. A tubular split-axle undercarriage has oleo legs. The strut and undercarriage tubing, like the rest of the material with the exception of the spruce, is A.I.D.-released. In common with the design as a whole, the control layout is the simplest possible, and practically the whole length of the elevator and rudder cables is carried outside the fuselage for accessibility in inspection. No rudder bar is fitted, its place being taken by two footplates hinged to the floor at their lower ends and pulling direct on the cables. A small luggage locker is behind the cockpit, which latter is surprisingly roomy considering the generally small dimensions of the machine. Later modifications will provide rather more leg-room than is at present available. The view in all directions should be good, and better still when the vertical Scintilla magneto and downdraught carburetter are replaced (as they eventually will be) by components lying snugly alongside the engine and within a cowling. On the instrument panel are an A.S.I., rev-counter, altimeter and cross level. The lubrication system of the engine is deemed by its makers to be infallible, so no oil gauge is fitted. The Perman-Ford engine develops 32 b.h.p., cruising at 3,100 r.p.m., and going up to 3,300 for take-off. It drives, direct, a Perman laminated mahogany airscrew of 4.1 ft. diameter and 2.14 ft. pitch. The tare weight of the machine is 425 lb. and the gross weight about 575-600 lb. The wing loading works out at 5 lb./sq.ft. The makers are E. G. Perman and Co., Brownlow Mews, Guilford Street, Gray's Inn Road, London, W.C.1. Flying trials are stated to have given the following very satisfactory figures: Cruising speed, 68 m.p.h. ; top speed, 76 m.p.h. ; landing speed, 35 m.p.h. ; fuel consumption, 2 gall./hr. A company is likely to be formed for mass production, and development of this interesting little machine will be watched with interest.